A mayoral representative, Lincoln Restler, speaks to a crowd of residents at an information session inside 1173 Bergen St. held on March 4. CROWN HEIGHTS — A second public meeting rescheduled to discuss the new men’s shelter to open on Bergen Street later this month will take place Wednesday night, the local community board and assembly representative said. 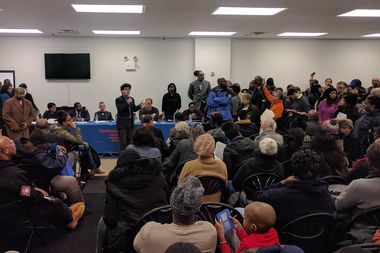 Brooklyn Community Board 8 said the meeting regarding 1173 Bergen St. — originally set for Tuesday night, but postponed due to the snowstorm — will begin at 6:30 p.m. Wednesday at P-TECH High School at 150 Albany Ave.
Officials scheduled the additional meeting about the 106-bed men's shelter after a raucous meeting about the facility filled to capacity on March 4. The Department of Homeless Services facility, originally announced to house men 50 years old and up, will now house men over 62 years of age, a change made amid the uproar from locals over the plan. The shelter will open March 22, operated by CORE Services. It's one of 90 proposed by the mayor as part of an overhaul of DHS. The informational meeting on the shelter will include representatives from DHS and CORE Services as well as elected officials, according to CB8. The Bergen Street shelter is one of three set to open soon in the Crown Heights area. A facility for 132 families will open in April on Rogers Avenue, the city announced, and another site for women is set to open in Prospect Heights.